Low Friction – Increases blowing distance. Easy to Use – Squeezed into the duct before blowing fiber optic cable. Tested and Approved – Recommended by most blowing equipment manufacturers. Winter Grade Available – Can be used in sub-freezing temperatures. Compatible with Cable Jackets – Avoid weakened or cracked fiber optic jackets. Multiple Use – For blowing fiber optic cable and microducts. Proven – Used over 20 years in the installation of over 500,000 km of cable. Polywater® Prelube 2000™ reduces frictional drag during the blowing of outside plant fiber optic cable into duct. It increases the distance cable can be installed in a continuous length. Prelube 2000™ can also be used to blow in empty microducts for future microcable installation. 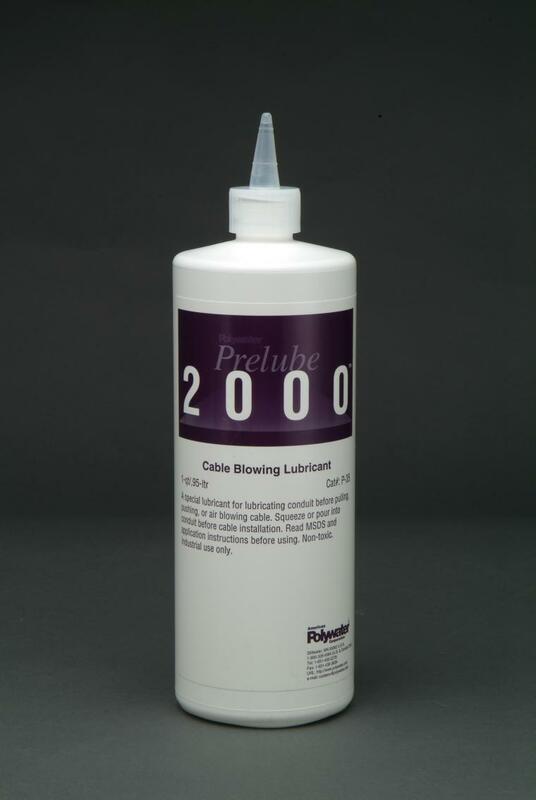 Use Prelube 5000™ for blowing the microcables; see related products on the sidebar. When cable blowing, the cable stops moving when the frictional force resisting movement equals the blowing force producing movement. The maximum blowing distance varies linearly with friction coefficient in straight conduit sections. The friction reduction shown for Prelube 2000™ can increase installation distance by a factor of 5 or more versus unlubricated duct. More information on these studies is published in our TeleTopics Newsletter Volume #11 (right sidebar link). Application: An airtight duct system with pressure-tight splices is critical to maximizing cable installation distance. Follow the equipment manufacturer’s instructions. Duct must be clean, dry and mandrel tested. Clean the duct by blowing a tight-fitting foam sponge through the duct with high pressure. If excess water or dirt exists, repeat this process. Prelube 2000™ is effective at a coating thickness of 0.5 mg/cm². See the article reprint on the right sidebar for additional information on duct preparation. For smoothwall duct and high air speed equipment with no missile, squeeze the recommended amount of Prelube 2000™ Lubricant into the duct. Spread the lubricant by blowing a foam carrier through the duct. The squeeze bottle (cat# P-35) is a good package for this type of application. For smoothwall duct 1 – 1.25 in/2.5 – 3.0 cm inner diameter and piston type machines, use 5 to 10 fl. oz. per thousand feet of duct/0.5 to 1.0 liter per kilometer. Place 75% of the lubricant in front and 25% behind the missle. The lubricant is spread by the missile as the cable is blown. The quantities of lubricant appropriate for any job will vary with the size, type and condition of the duct. Use the recommendations above as a place to start and adjust as necessary. Polywater® Prelube 2000™ comes in two grades: regular grade (P) and winter grade (WP) for cold weather use in temperatures as low as -20°F/-30°C. The 1 quart/0.95 liter bottle is the most popular for field use. The long nozzle makes the injection of the lubricant easy. Prelube 5000™ is recommended for the installation of microcables in microtubes. See related products on right sidebar.